Sports Costs > How Much Does a Paddle Board Cost? A paddle board is a great alternative to a longboard. Whether you want to cruise a lake or even a river, this board allows you to stand up and paddle your way around the water. On average, a paddle board can cost anywhere from $400 to as much as $2,000 for a professional, competitive board. Cheaper boards will be made from plastic, while a lighter weight option can be near the higher end. Stand up boards are going to cost anywhere from $500 to $1,800. For example, the Sevylor Samoa Stand Up Board has a four-inch raised tip, a built-in carry handle kit and a high-pressure pump. This particular model retails for $590 to $700. The Emotion Kayaks has a paddle board that is made from blow-molded plastic. This model costs anywhere from $380 to $450. Inflatable paddle boards are designed for those who want to transport them easier. These boards, on average, can cost anywhere from $450 to $1,000. For example, the Boardworks SHUBU inflatable paddle board will cost you anywhere from $870 to $1,000. StandupJournal.com says very high-quality boards can start out at $1,000 and be as much as $3,000. Paddle boards will have two types of hulls: a planing and displacement hull. A planing hull is flat, wide and will look like a surfboard. This handles great on ocean waves and is ideal for beginners since they are stable. A displacement hull is designed for those who are planning on traveling long distances. These boards will look like a kayak and are designed to be more efficient when compared to a planing hull. In terms of length, these boards can be as short at nine feet to as long as 14 feet. Shorter boards are designed more for surfing, while boards in the nine to 12-foot range are designed for all-around use. Longer boards are geared toward those who want to race. As for widths, boards will be 29 to 36 inches wide. The longer the board is, the more stable it will be. Paddle boards can be commonly made of up of the following materials: EPS foam, hollow core, polyurethane foam or an inflatable material such as PVC. Each board will come with a fin — a part designed to provide traction and stability. These fins can be large, straight, flexible or part of a three pin setup. Some paddle boards are going to come equipped with a paddle. While most prefer to invest in a more expensive model, this one shall suffice for the average user. Inflatable boards will more than likely come with a portable inflator, but this isn’t always the case. Be sure to check the manufacturer description to ensure that one may come with one. For those who want a more expensive paddle, these can range anywhere from $50 to $200. Choose a paddle that is about six to eight inches taller than you. Wetsuits are highly recommended for those who are going to take the sport seriously. A wetsuit, depending on the brand, will start at $50. Recommended by the U.S. Coast Guard, a life jacket is highly suggested to remain safe in open waters. If the inflatable versions don’t come with an air inflator, the cost of a portable inflator can start at $20, depending on the power output and brand. A leash is also recommended, so if you fall off your board, you will be able to keep it near you. If you’re traveling by car, don’t forget a car rank since these boards won’t be able to fit in a car trunk. Be sure to know what type of size and style of board you’re going to want to purchase. It’s best to try one in person to get a good feel of how it fits your body. It’s important to understand these boards must work to your size because if the board doesn’t displace the right amount of water, it will be hard to be supported by the board. All boards should have a volume and weight capacity limits under its specifications. You can either find this on the label or if you purchasing online, you should be able to see it online. Each and every brand is going to greatly vary. Be sure to research these brands to find one that not only has a great reputation but one that has good reviews online. Don’t know how to paddle board? Try this guide or this video. Consider purchasing your board second hand. Websites, such as eBay, have used boards that can cost up to 70 percent less than buying new. If you live in a beach-based town, check your local Craigslist. Many surfers tend to give up older boards so they can upgrade them. 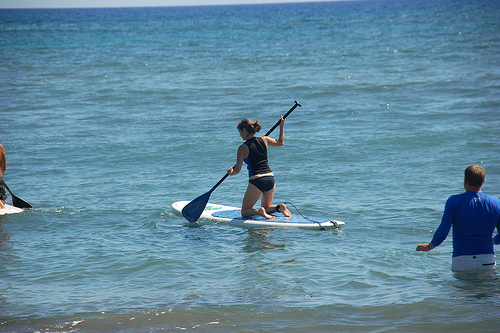 Renting a paddle board is often an option for those traveling to destinations. Depending on the destination, this can be for as little as $40 for the day.